This cone geyser is an icon of Yellowstone National Park. The team who discovered Old Faithful described it as “the perfect geyser.” Though not the tallest or largest in the park, the geyser is one of the most popular for its beauty, size, and regularity of eruptions--almost every 91 minutes, hence its name. Watch the explosion of boiling water reach a height of 32 to 56 m (106 to 185 ft) for around 1.5 to 5 minutes, giving you plenty of time to take photos. The cafeteria in the nearby lodge boasts great views if you want to watch the show over a sandwich. They also do take-out. Choose to start, finish, or center your holiday on a trip to Old Faithful by using our Yellowstone National Park trip planning app . Old Faithful is the world's most famous geyser, and its fame comes from the fact that erupts regularly at intervals of 30-45mins since it was discovered. The spectacle of the geyser is emphasized by a ceiling installation arena that greets visitors, who can sit and wait for the eruption. The geyser eruption is very powerful and can reach 10 m. Overall however, the installations of the Park and its proximity to many facilities like lodge, restaurants, gift shoip etc. .. makes it much less natural ... This is the only reason I rated only 4/5. A lot busier than I remember as a kid. There is plenty of room to grab a seat and wait for the show. The area around it built up with restrooms, hiking trails, a gift shop, coffee shop, and plenty of parking. 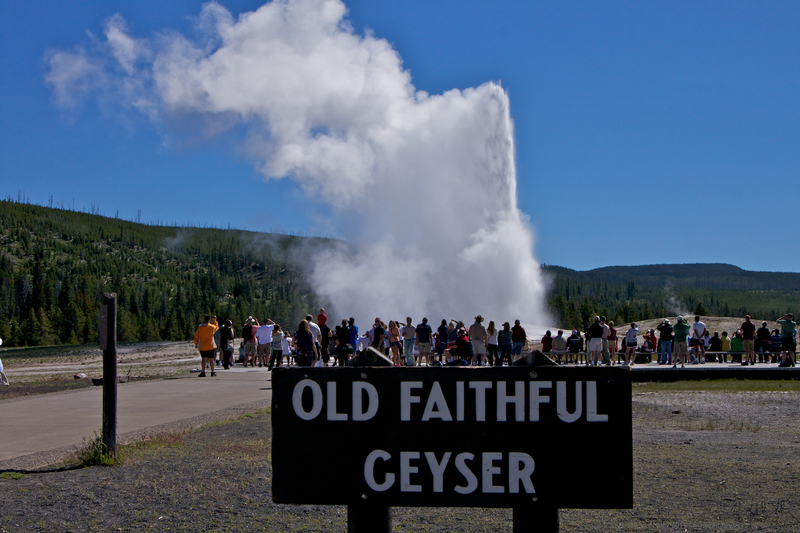 If you make your way to Yellowstone then you have to make the trip to Old Faithful. This is easily accessible to anyone young or old. Make sure take the time to see this natural wonder. It has been something like 57 years since I was last here, and it was very much as I remembered. This is not the largest geyser here, but it's probably the best known. And humans had nothing to do with it! It's amazing, spectacular, and fir me, like seeing a squirrels little old auntie that I had somehow not seen for years--it looked and acted as I had remembered, even though I have missed all those thousands of eruptions over all these years! The information available for explaining what is happening is so much better than what was known when I was here before, and I read everything I could get, as I find it so interesting. Go see for yourself!